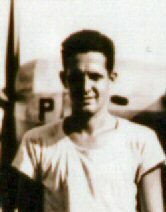 James F. Finlay entered the Army Air Corps as a volunteer on 14 June 1941 at Barksdale Field in Bossier City, LA. After the war began, he was transferred to Delgado Trade School in New Orleans for engine mechanics training. Later that year (1942), he was transferred to Columbus, Mississippi, then to George Field (Lawrenceville, IL) in 1943 and later to Champaign, IL. It was from there that he made his way to Smoky Hill (Salina, KS). James Finlay married Dorothy Murphy on Feb 2, 1942 (Ground Hogs Day). They have two sons (Jimmie and Paul), five grand children and one great-grandson. 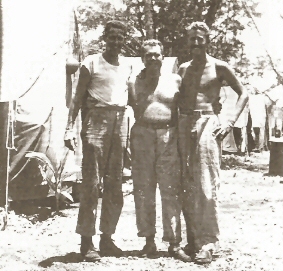 While flight crew 29 was preparing to leave Guam, a group of "high point" men were brought in. As a result, on the day before Halloween, 1945, Capt. Ferrell told my dad that he had been "bumped" from the flight because he did not have enough points. However, when the plane left the next day, other members of the flight crew "stowed him away" and when he was mustered out at Barksdale on November 14, had unofficially been AWOL for a week. Fortunately, word had not reached the states. 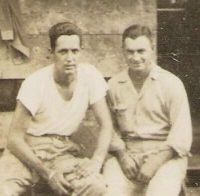 Following the war, dad went back to Cullen and went to work for the United Gas Company and remained with them 36 years until he retired (by then it was owned by Pennzoil). For the last 20 years, his greatest joy was traveling about the country (including a trip up the Al-Can to Alaska) with my mom and other friends and family members in their motor home. James F. Finlay died 8 September 2004. He was buried in a country church cemetery beside their home outside of Monroe, Louisiana. If you can help identify the men pictured with Finlay, please email updates@39th.org.